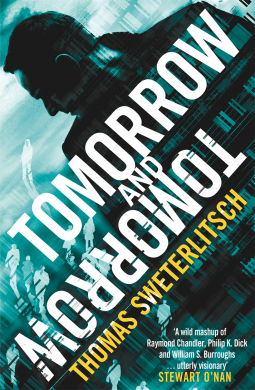 Tomorrow and Tomorrow is a thriller, and a journey of personal discovery, with a clever conceit at its heart. After a US city is devastated by a dirty bomb, an archive of their digital footprint is created. The citizens every move is tracked and stored, as a memorial, as a place for the survivors to visit to relive time with their deceased loved ones – and more disturbingly, as a tourist attraction, and as a means of settling insurance claims. The protagonist works in the Archive as an investigator in the latter capacity – tracking down individuals on the day that the city ended, in an effort to satisfy insurance companies. But one of the bodies he’s investigating looks like a murder – and so he begins to investigate, increasingly obsessively, perhaps as expiation for his wife’s death in the blast, and his own survival. The personal side of the story works very well. The protagonist is immediately shown to be deeply broken, burdened with survivor’s guilt, and unable to let go of his past. Over the course of the text, this burden doesn’t lift, exactly, but the reader is shown how it may begin to be borne more easily. The author gives us a protagonist in pain, in denial, and desperate – and each of those emotions is believable, and wrenches at the reader with immediacy and passion. Blaxton’s internal psychodrama is brilliantly realised, and holds the reader’s attention across the pages of the book. The thriller portion is less effective, but perfectly reasonable. The structure surrounding the central mystery is familiar, but the elements are a little different. The investigation, the turning up of clues, is certainly tense enough – and the denoument is wonderfully done, tying in with the protagonists personal growth. Still, it felt more workmanlike than sublime – a means of moving the character forward, but not as immediately compelling as the character it transported. The world that this all takes place in seems a darker mirror of our own – the growth of corporate power, an increasingly monarchical and religious US Presidency, neural interfaces with corporate sponsors, christened ‘AdWare’, televised executions, and, of course, the obliteration of a city. The overall tone is evoked nicely – there is an oppressive sense of desperate corporatism over the entire world of the text. But here and there, it seems to slip up – in an effort to emphasise the awfulness of the setting, it pushes further and further into the extreme, with some loss of plausibility – a move from the disturbing into the simply grotesque (if nothing else, the ubiquitous neural net seems to serve little purpose other than to fling salacious advertising at its owners – so why would anyone have it put in?). In any case, this remains a solid book – it approaches, and examines unflinchingly, themes of forgiveness, of guilt, of survival – the importance of memory and the importance of letting go, all wrapped around a mystery. Though the world and the mystery aren’t as compelling as they could be, they are decent enough – and the protagonists journey is fascinating enough to forgive imperfections elsewhere. Worth the read!